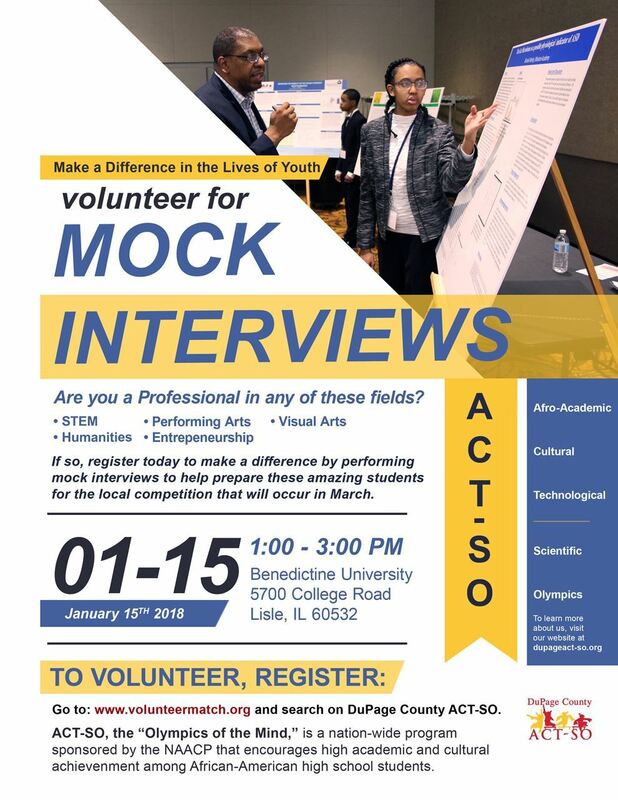 DuPage County ACT-SO high school students started preparing in September for the "Olympics of the Mind" competition and they need your help in preparing for the judges interviewing portion of the competition. Can you please assist them on Monday, Jan.15th (MLK Day), 12:30-3pm to perform mock interviews in the Humanities (Essay, Poetry, Playwriting), Entrepreneurship, Visual Arts (Painting, Drawing, Sculpture, Photography, Filmmaking), the Sciences (Biology, Physics, Health/Medicine, Chemistry, Computer Science, Architecture) or Performing Arts (Dramatics, Oratory, Dance, Music Vocal, Music Instrumental, Poetry Performance) at Benedictine University in Lisle. Please register on volunteermatch.org (search on ACT-SO) and respond to this email with the categories that best fit your background. To learn more about the DuPage County ACT-SO Program and the category guidelines please visit: www.dupageact-so.org.